TACOMA (June 3, 2016) — The tide is turning against the TPP, and Tacoma plans to celebrate. The Trans-Pacific Partnership, the massive 12-nation “free trade” agreement that would set NAFTA-like rules for about 40 percent of the global economy, is growing more and more unpopular. The official government report — expected to boost the case for the TPP — actually found that its positive economic impact would be statistically insignificant. All three remaining presidential candidates oppose it and say they want to negotiate a better deal for American workers and the environment. Here in Washington state, Rep. Adam Smith (D-9th) announced that he will vote “no” on the TPP, and the Washington State Labor Council, AFL-CIO turned up the heat on his congressional colleagues who haven’t said how they intend to vote. The work that organized labor, environmental groups and others are doing to stop the TPP is having an impact. So much so, that desperate — and increasingly xenophobic — TPP supporters have pinned their hopes on ramming the TPP through Congress during the lame-duck session between the election and the swearing in of our next president. At noon, participants will gather to rally against the TPP. The keynote speaker will be Larry Cohen, Past President of the Communications Workers of America, followed by short speeches from local labor, environmental, and community organizations. The rally will be immediately followed by a trade-themed festival. Bring your families and friends for free food, craft stations, and live music from local staples The Pine Hearts and Kim Archer. Play for prizes in our Carnival of Corporate Greed, or better yet, recruit 4-6 people and join the Trade Triathalon where your team can compete with your neighbors in games like the Three-Legged Race to the Bottom and Democracy Tug-of-War. 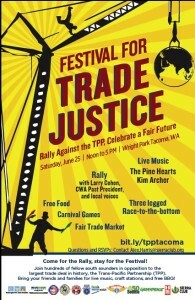 This rally and festival will be Saturday, June 25 from noon to 4 p.m. at Wright Park in Tacoma. Sign up here for updates, to volunteer, or to put together a team for one of the events. See the Facebook event page for more information. The sponsors include Washington Fair Trade Coalition, Sierra Club, Communications Workers of America, Washington State BlueGreen Alliance, Pierce County Central Labor Council, Food and Water Watch, 350 Seattle, International Longshore and Warehouse Union Local 23, Teamsters 117, IAM 751, Greenpeace, Equal Exchange. Interested in sponsoring? Email michael@washtech.org or Alex.Harris@sierraclub.org. Building up to the big rally/festival, on Thursday, June 9, there will be a general overview of the TPP and what it means to Tacoma. Participants will then break out into groups with local experts to delve into some controversial aspects of this massive trade deal that are rarely discussed. Learn how the TPP is linked to wage stagnation, why indigenous groups from South America to Southeast Asia are marching against it, and how it would allow fossil fuel companies to sue governments for common sense regulations. This event will be Thursday, June 9 from 6 to 8 p.m. at the University of Puget Sound’s Kilworth Chapel, 1500 N. 18th St. in Tacoma. It is sponsored by the Sound Policy Institute, Sierra Club, Communications Workers of America, Washington Fair Trade Coalition, Washington State BlueGreen Alliance, Food and Water Watch. See the Facebook event page for more information or to RSVP. Please make plans to attend both of these important events and to spread the word about them.